I had quite a few highlights from amongst all the work that was showcased. The most memorable for me was seeing My Song, scripted by Charlie Swinbourne and directed by William Mager. The blurb on the British Sign Language Boradcasting Trust website describes the film as "a coming of age story which follows Ellen, a young deaf girl stuck in the middle of the deaf and hearing worlds." It was a seminal film catching that transition when you discover there are other communities out there whose sense of being in the world is more closely allied with your own. My Song is specifically about a hidden side to Deaf life - the frustrations of trying to fit in and facing rejection from both sides of the fence in your attempts to find yourself. 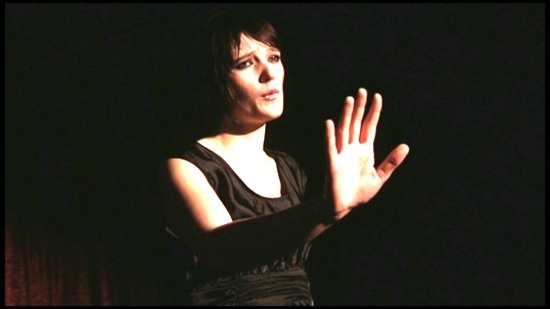 Still of actress Lara Steward from My SongThe story is very clever in the way that it gives you a range of perspectives on what it means to grow up as a deaf person. I thought it worked extraordinarily well in communicating how passion for rights and equality can become distorted when the ends take over from the means of achieving your aims. In many respects My Song tells an age old story of the quest for identity. It reminded me strongly of a time in the mid-1990's when I strongly identified with being a survivor of the mental health system although I hadn't been sectioned out-right. As the film skillfully illustrates there are many types of deaf people – there are also many types of survivor. Fitting a group within a narrowly defined label often leads to exclusion for people who identify but are coming to terms with impairment, culture, and of course language differences for the deaf community. It is one of Dada-South’s greatest strengths that it looks to breaking with the boundaries that you have to define in this way or that way to belong. It recognizes that the greatest asset is you have an as an artist is your own experience. That was something evident in all the diverse variety of work shown in the Up-Stream showcases by Charlie Swinbourne, Oska Bright, Sally Booth, Gary Thomas, Juan delGado, Jon Adams, Freewheelers, Deaf Men Dancing, and Project Artworks. A big part of the project was a bid to give the artists a professional push in the right directions and I look forward to following up with reports on where the work goes next!